When you think about efficiency in a laundry room, start by considering the way you use the room. There are four primary tasks on laundry day: sorting, washing, drying and folding clothes. If you are planning to remodel your laundry area or just want to get clutter under control, organize a laundry room according to these tasks. No matter how or where you sort the laundry, make sure you have the space you need to organize items, especially if you have a large family. If you sort in the laundry room, well-designed space can make the job easier. A washer that is in good condition (see our “Laundry Room Safety Checklist”) for tips. Select an appropriate model for your space. A front-loading washer with controls on the face, not on the back, can be covered with a counter or board to create a space for folding clothes and storage of items you need to have on hand. 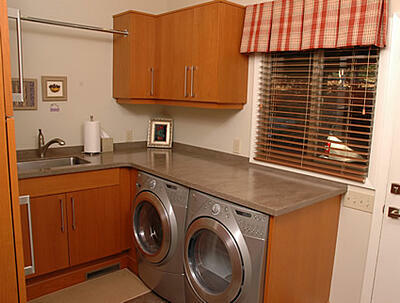 If your laundry area is tight, a stackable washer and dryer will conserve space. Consider a pedestal base for your washer and dryer that has a storage drawer. The pedestal will also raise the height of the appliance to ease loading and unloading laundry. A laundry sink. It could be a deep utility washtub or built into a cabinet. Stained items can be pre-treated in the sink and hand washables can be soaked. If you have a built-in sink, a gooseneck faucet with a spray is helpful for spot cleaning. Storage for supplies. Cabinets and shelving help keep supplies organized and accessible. Based on the size of most detergent, fabric softener and bleach bottles, shelves should be at least 12 inches deep for both open shelving and cabinets. Tall narrow cabinets are great for a laundry room and can be equipped to hold ironing boards and iron, or set up as a broom closet. Hooks can be added to the back of cabinet doors to hold clothespins, rags or other small items. If you have a door that leads into your laundry room, install hooks on the back of the door to hang items. If your laundry room has cabinets, consider installing pullout shelving to ease access to the contents. Drawers can be used to store small items such as laundry markers, stain pens, mending supplies, buttons, scissors etc. Dividers will help keep the contents organized. If you have open shelving for supplies, use baskets and shelf dividers to keep items organized. Keep your dryer in good condition. Save time and avoid fires by cleaning the lint filter of your dryer after each use and the outside vent filter each week. Place a door clothes hanger on the door of your laundry room to hanger clothes that require air-drying, like lingerie and delicates that will later be ironed. The door hanger is also a great place to hold ironed clothes. Use collapsible racks for air-drying clothes and sweaters that can be folded after use and stored along a wall. Install a retractable clothesline in the room. Install a rod under an upper cabinet or over a sink. You may also want to install a fan that vents to the outside to provide air circulation in your laundry room. The circulating air will prevent moisture build up that can lead to mold and musty odors. It will also help speed up air-drying of clothes that can’t be put in the dryer. If you prefer to fold your clothes in a laundry room, you’ll need a work surface. Counter space is the best. Counters can be easily kept clean and are the ideal height and place for folding laundry. If your laundry is located in a closet or basement, a narrow bench nearby could suffice. An old table could also be a great place to fold clothes or organize laundry baskets. Mobile carts are also efficient in laundry areas because they provide a place for folding and storage underneath. Plan appropriate lighting. There should be task lighting near the machines and over work areas. Decorative lighting in laundry rooms is becoming a “hot” trend. Use attractive and uplifting paint colors. There is also a resurgence of wallpaper in laundry rooms. Place artwork on the walls. If your laundry room has natural light, add a houseplant or two. If you spend a lot of time each week doing laundry, make the space as pleasing as possible and the work will be less of a chore.